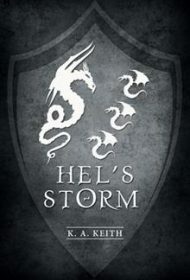 Hel’s Storm, the second in a fantasy quest duology inspired by both classic and modern epics, provides a gripping read filled with clever characters and exciting action. This volume continues the story of the knight Apieron and his band of adventurers as they journey to save Apieron’s home country of Ilycrium from the forces of evil. A demoness thought long-defeated returns to the land. Meanwhile, the king has been assassinated, and Apieron believes his family is dead. Teaming with elves, dwarves, a thief, and numerous other allies, he continues his travels and faces foes to save Ilycrium from never-ending peril. As a standard good vs. evil story, the influence of the classic epics and more recent authors such as J.R.R. Tolkien and George R.R. Martin is clearly felt here. This makes for some familiar elements, such as nature- and peace-loving elves, gruff mountain dwarves with Scottish dialects, and villains who hate commoners merely for being common. But there’s also more character diversity than generally seen in medieval Europe-esque fantasy stories, most noticeably the inclusion of female characters within the main cast and in combat roles. The book also benefits from a wide variety of fantasy creatures, including centaurs, incubi, giants—and even a few that readers haven’t seen before, such as the Aeralds, the winged steeds of the elves, and a race of demon apes. Combined, they present multiple obstacles for the heroes to overcome and exciting battle sequences. There are even some humorous moments to break the tension; for example, after a character is made a legal citizen, his friend drolly remarks that all that’s changed is that he now has to pay taxes. The language can be somewhat archaic with a few cases of ‘ye olde’ type speech, but otherwise the author skilfully tells the story with clean modern prose. In short, Hel’s Storm is a worthy sequel to the first book. Readers will heartily welcome this series to the epic fantasy genre.